I am off on holiday skiing, and not cooking at all (not even making a cup of coffee!) for the first time in a looooong time! I am eating the wonderful food that they are making at the Hotel San Lorenzo in Bormio (I will post more about it later on), so with this recipe I am just catching up a little with the Only Recipes blog (I didn't manage to copy all my recipes through yet) and offering something for those who are enjoying the last few weeks of Summer in the Southern Hemisphere with lots of wonderful produce like capsicums, eggplants and the last zucchini. Yes, this is my favourite creation, it takes time to make but it can last a week, and the flavour gets better and better. 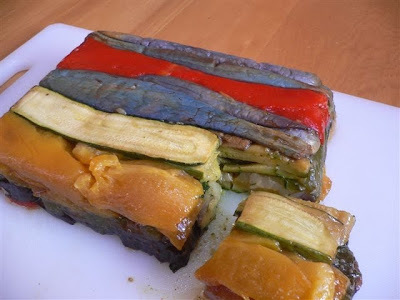 For the ingredients...no measures really, just be aware that you will need a lot of olive oil and lots of eggplants (I use both Italian eggplants and the long Asian eggplants), plenty of zucchini, and red, green and yellow capsicums. Cut all the vegetables in long and large strips, sweat the eggplants with salt for 30 minutes, then rinse and pat dry. Then, using plenty of olive oil, start frying. This is going to take a looooong time. First fry the zucchini, then set aside. Fry the eggplants, set aside; finally fry the capsicums (which have the strongest flavour, so they would alter the flavour of the oil). You will need to add oil from time to time, and be very careful to cook well the vegetables without burning them. When the capsicum are cold remove and discard the skins. Finely chop plenty of garlic with tons of parsley. Add few more herbs if you wish, either a little mint of a little basil are good. Add salt to taste. You should make about a cup of this. Line a container with grease-proof paper and make a layer of vegetables (this will be the top, so make it pretty! ), add some chopped herbs, then a few drops of white wine vinegar and sprinkle with breadcrumbs. Repeat, making as many layers as you can. Top with some more grease-proof paper and press down gently. Refrigerate for one day. Before serving you can tip the 'torta' on a platter, and then cut into small slices. You will get many portions out of it, as it is so compact and full of flavour! This looks gorgeous. I have all those things in my vege crisper after my trip to the market coming up, so this looks like just the thing to make on a leisurely Sunday afternoon.